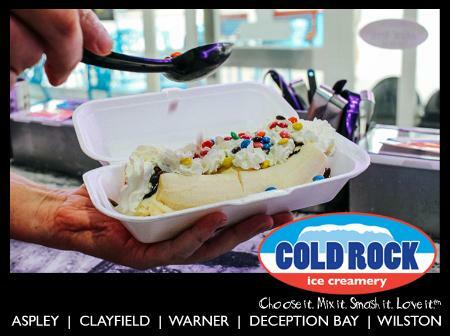 At Cold Rock Deception Bay, we are all about the fun experience so that’s why we let you pick your favourite combination and let us create it on our unique ‘Cold Rock’ right in front of you. Unlike others that have pre-blended ice cream, we allow our customers to choose their mix-ins, toppings and ice cream of choice, after which an ice cream artist then blends the concoction together on a frozen granite slab. Our store has an enormous range of premium ice cream, lowfat ice cream, gelato and sorbet flavours to choose from. These combined with all of the wonderful delights to mix in, provides you with over 3,500 different flavour combinations to choose from….other ice cream just got boring! Your choices are not just limited to ice cream in a cup, you can also take your delicious combinations home in a take home pack, or mix them up into a cake to celebrate any occasion. If you are feeling thirsty whilst in store then we also have a yummy selection of Super Shakes, Smoothies and Spider drink options. So...what are you waiting for? Get in store and enjoy the Cold Rock Deception Bay experience today!! Here is a sample of popular combinations you could try at the Deception Bay store: * Cookies and cream ice cream with smashed M&M's and Oreo's * Chocolate ice cream with smashed Snickers and Maltesers * Aussie Vanilla ice cream with smashed Strawberries and Chocolate Fudge * Bubblegum ice cream with smashed Flake and Gummy Bears.